Globally, 60 percent of adults conduct their financial affairs with the benefit of an account. In Kenya, thanks in large part to mobile money, 2014 estimates from the World Bank’s Findex survey program suggest that nearly 3 in 4 adults have an account. In the recent Brookings Financial and Digital Inclusion Project (FDIP) Kenya ranks 1st among 21 emerging economies in enabling access to and usage of financial services among people excluded from formal finance. Kenya is making headlines and emerging as a globally recognized leader in financial inclusion. What is behind this success, and what challenges remain? This article highlights some of the characteristics, developments and trends in the financial landscape in Kenya and starts with an illustration of the role financial services play in the lives of Kenyans. 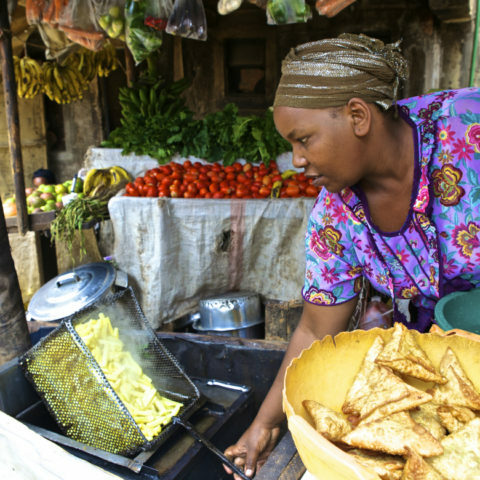 In Kenya, people build a portfolio of both formal and informal financial services to meet a range of needs. Patrick, one of the respondents in the Kenya Financial Diaries builds and sells jikos (charcoal stoves) out of salvaged scrap metal, earning an average of around Ksh 22,000 every month (about USD 260) and uses those earnings to care for three sons who live with him and three other children who live with his wife upcountry. He plans and manages his financial life using a range of complementary tools to achieve his objectives – 15 different financial devices to be exact. 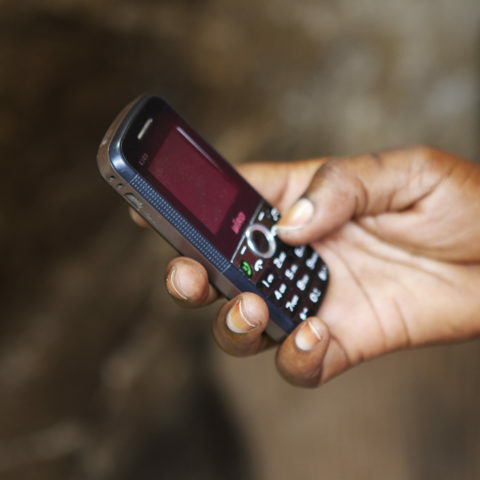 The M-PESA account on his mobile phone enables him to regularly send money to support his wife (a task that was inconvenient, costly and time-consuming before mobile money); his three chamas (savings groups) provide discipline so that he can regularly put money aside with different maturities to make periodic lumpy expenditures; he keeps larger sums of money which he can claim at any time, safe in a current account at a commercial bank; money kept at home, “under the mattress”, allows him to smooth day to day cash flow needs; and strong social relationships enable him access to credit at shops and from friends if he has cash flow problems. The range of choices Patrick has as a consumer of retail financial services are in part a result of an unprecedented expansion of retail banking and mobile money, but also the stickiness of traditional, informal and more socially embedded forms of finance that are able to serve his needs in ways that current formal services such as bank accounts simply can’t. That said, even with informal financial tools, there are important gaps and limitations. 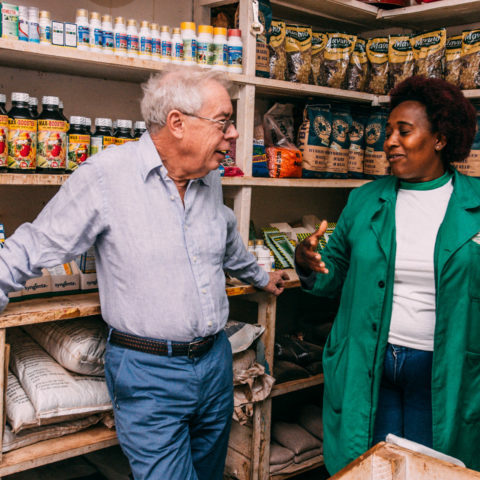 For example, savings vehicles like chamas don’t make it easy to both accumulate capital and provide liquidity to manage short term cash flow needs and the social remittances people rely on to deal with risk don’t offer complete protection when unexpected set-backs arise. Financial service providers are diverse and key regulators are focused on inclusion. Today in Kenya there are 44 commercial banks, 12 deposit taking microfinance banks, 30 non-regulated credit-only microfinance institutions, 199 registered savings and credit cooperatives (Saccos), 5 mobile money operators (Table 1), a large number of community-level services providers such as village banks, financial services associations (FSAs) and savings groups and a growing number of start-ups in fintech looking to build a new generation of financial services. The Central Bank of Kenya (CBK) develops the laws, regulations and guidelines that govern commercial banks, microfinance banks, credit reference bureaus, mortgage finance companies and others in the banking sector. In addition to ensuring the financial system’s stability and efficiency, CBK is also mandated to focus on access thus bringing financial inclusion into the mainstream. In 2014, 7 years after mobile money was introduced, the National Payment System (NPS) regulations were passed into law, providing the first formal legal framework for mobile money and paving the way for increased interoperability across payments providers. In general, the regulatory environment has encouraged and nurtured innovations in the financial sector, including mobile money. Source: Central Bank of Kenya, SASRA. Data represent state of sector in December 2014. In the past ten years commercial banks and telcos made significant investments in distribution channels in order to reach new customers and capture network effects. 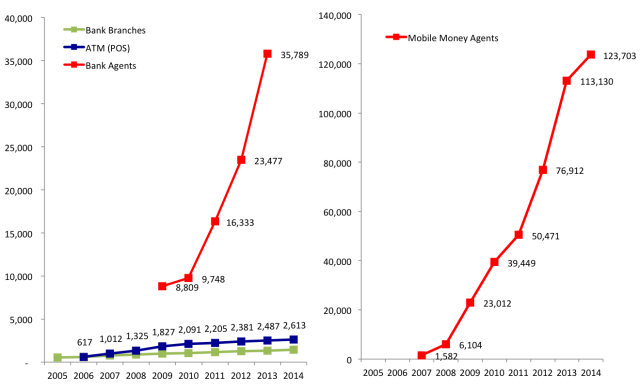 Between 2005 and 2014, banks multiplied access points by nearly tripling branches and more than quadrupling ATMs (Figure 1). Over this period the mobile money agent network grew at an average annual rate of 86 percent per year as telcos were building the cash-in, cash-out points that enable people to convert cash to electronic money and vice versa (Figure 2). 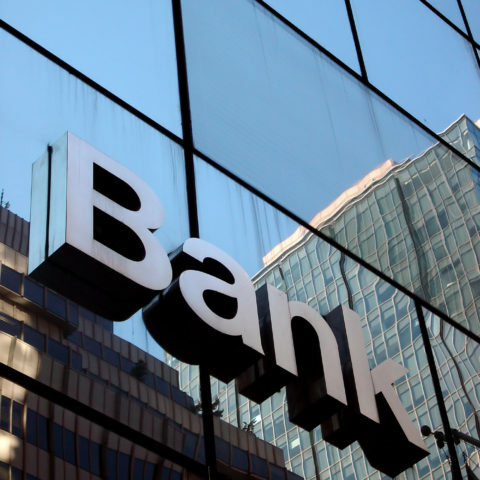 With the amendment of the banking act in 2009 that permitted banks to recruit third parties as outlets for certain banking services, commercial banks were soon to follow in building agent networks of their own. In 2009, 8,809 agents, representing five banks, were providing services. By 2014, 35,789 agents representing 16 commercial banks were deployed. Legislative reform in 2012 also allowed microfinance banks to provide agent banking services and since, three have started to use agents. The network of over 155,000 agents that mobile money operators and increasingly banks have set-up to serve customers dwarves the number of brick and mortar branches, stand-alone ATMs, post offices and other access points, and this new approach has brought services closer to people. In 2012, the FinAccess FSP Maps project found that 76.7% of Kenya’s population lives within 5 km of an access point, a significantly higher percentage than other countries in the region. Reaching remote and rural populations, however, remains a challenge. For example, the same study found that while everyone in urban areas lived within 3km of an access point, in rural areas only around 60 percent were within 3km. Also, in a majority of the counties in the arid and semi-arid north and east of Kenya, less than a third of the population was within 3km of an access point in 2012. More recent indicators of proximity to financial access points will be available when FinAccess geo-spatial data collected in 2015 become available. Investment in distribution channels has led to stunning growth in the number of accounts. Between 2005 and 2015, bank deposit accounts increased from 2.4 (12 accounts per 100 adults at or above the age of 18) to 28.4 million (122 accounts per 100 adults), an average rate of growth equivalent to a doubling of accounts every two years (Figure 2). Even more remarkably, mobile money reached its millionth account within the first year of its deployment as M-PESA by Safaricom in 2007, its 9 millionth account just two years later and doubling to 16 million just one year later in 2010. Mobile money’s exponential rate of growth tapered after 2009, reaching 25.2 million or 109 accounts per 100 adults above the age of 18. Over this time period, 3.2 million mobile accounts were being added each year or close to 9,000 per day. Close examination of the trends in bank deposit accounts reveals another remarkable fact. 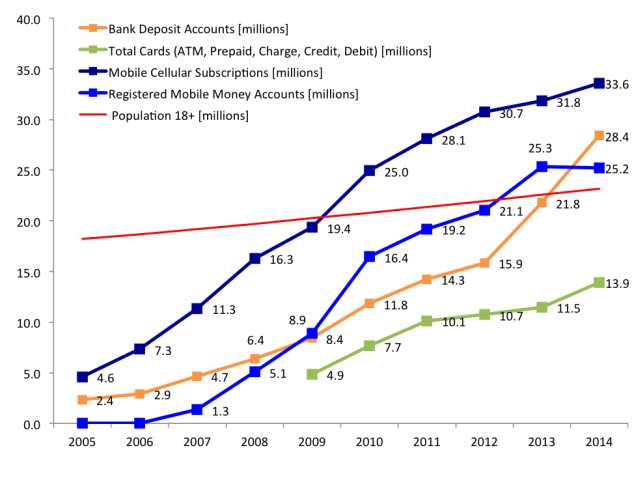 While total mobile money accounts surpassed and seemed to be diverging quickly from bank deposit accounts in 2009, by the end of 2014, total bank deposit accounts caught up to and exceeded total mobile money accounts. While the period from 2005 to 2012 saw remarkably strong growth, the sector shifted into higher gear with total bank deposit accounts nearly doubling from 15.9 to 28.4 million between 2012 and 2014. The drivers of growth in these two periods are different, but both represent a deliberate search for more cost-effective distribution channels. Prior to 2012, commercial banks, such as the now globally recognized Equity Bank, expanded down-market, implementing transaction based revenue models and creating more appropriate products for lower income consumers. In fact, between 2005 and 2012, the average deposit size per account fell from Ksh 207,345 in 2005 to Ksh 106,224 in 2012 a reduction of 50 percent. Given the success of mobile money, commercial banks were not far behind in seeing the opportunity to use mobile phones as a channel to drive growth. Both the emergence of agency banking and the design of digital financial services built on the foundation of mobile money have enabled banks to offer services to additional users at lower cost and increasing competition will put further downward pressure on prices. In November of 2012 the Commercial Bank of Africa (CBA) in partnership with Safaricom launched a digital financial service called M-Shwari which enables anyone with an M-PESA account to open a CBA bank account to deposit savings or access loans. In March of 2015, KCB and Safaricom launched KCB-MPESA, a similar combined savings and loan product. (Read this for a comparison of KCB-MPESA and M-Shwari). 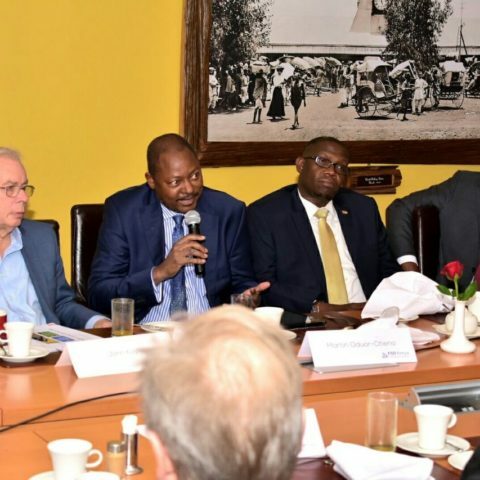 More recently in July of 2015, Equity Bank launched a suite of mobile banking services for its customers through the Equitel sim card which can be obtained at its bank branches. Unlike M-Shwari and KCB-MPESA, however, electronic transfers on Equitel do not rely on the M-PESA network. While there are now enough deposit and mobile money accounts in Kenya for every adult at or above the age of 18, multiple account holding, dormancy and unequal distribution does not guarantee universal access to financial services. So while the supply side data does suggest financial services have become more available to wider segments of the population, demand side surveys are better positioned to measure to what degree Kenya’s population broadly, and specific sub-groups, have been able to access formal services. Since 2005, donors and the government of Kenya have invested in eleven nationally representative household surveys to measure levels and trends in access to and usage of financial services at the individual level. 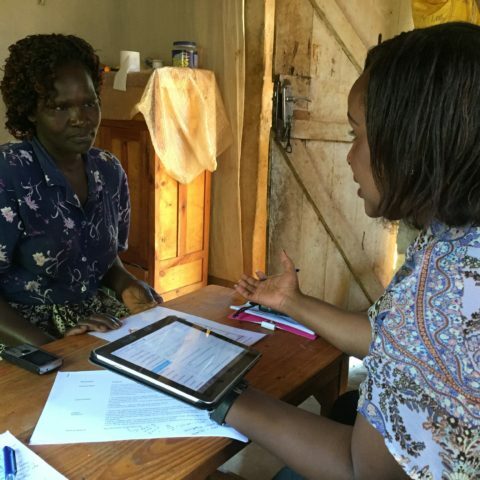 FSD Kenya, has led this effort with the 2006, 2009, 2013 and 2015 FinAccess surveys, an interim tracking focused on digital credit was conducted in 2017 and an additional full FinAccess survey is being planned for 2018 . In 2011 and 2015, the World Bank conducted the Global Findex survey and between 2013 and 2015, Intermedia conducted the yearly Financial Inclusion Insights Tracker survey with a focus on measuring access to digital financial services. Financial inclusion indicators constructed from each of these demand surveys provide a fairly consistent picture of broad trends. The percentage of the adult population (ages 18 and above) actively using either an account from a formal financial service provider (such as a commercial bank, Postbank, Sacco or MFI) or from a mobile money operator increased from 25.7 to around 75 percent between late 2006 and late 2016 (Figure 3), representing an average annual growth rate nearing 13 percent (far outpacing population growth of around 2.6 percent). In absolute terms, between 2006 and 2014 an estimated 12.5 million adults accessed an account for the first time. Among the poorest 40 percent of adults, the growth in usage of accounts increased even more rapidly, from 16 percent in 2006 to around 50 percent by late 2016. 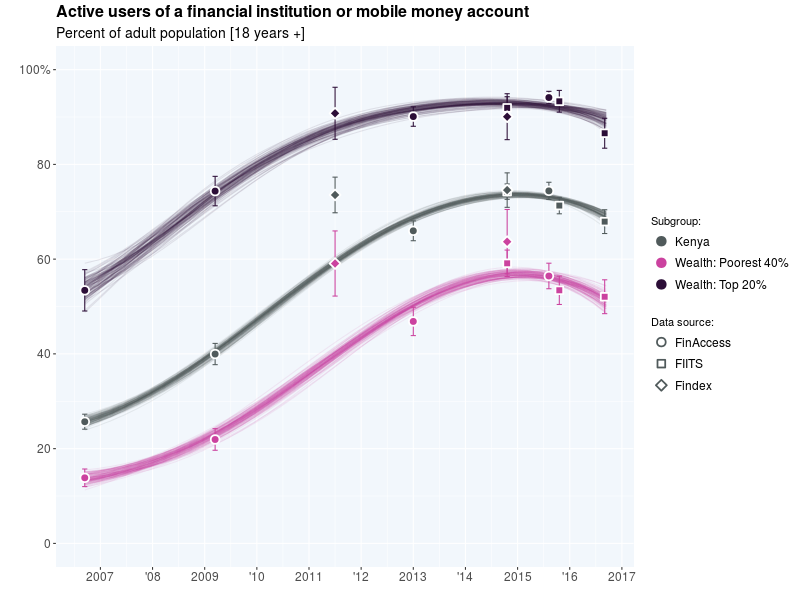 Financial inclusion over time (see https://fsdkenya.shinyapps.io/fintrends/ for an interactive version of this chart). The scaling of new business models, major investments in distribution channels and a regulatory environment that fosters innovation were some of the factors that have resulted in more people using a wider range of financial services. However the emergence of mobile money was arguably the most important factor – it amplified the embedded nature of financial transactions in social relationships, making those transactions (that often happen over distance) significantly more affordable, convenient and reliable. With mobile money now reaching close to three quarters of Kenya’s adult population, it is making possible a new generation of digital tools that can deliver financial services anywhere and at any time. Challenges remain. Around 20 percent of the Kenyan population still does not own a mobile phone and around 18 percent are financially excluded. Further expansion of services to low-income clients will become more difficult as they are poorer and more isolated. But perhaps the more fundamental challenge to meaningful inclusion is the large disconnect between what people expect and want their scarce incomes to do for them and their families, and what is offered by financial institutions. In order for financial markets to truly work for the poor, they need to help people solve the problems they care about. Digital technologies have helped lower costs and increase access but it will take thoughtful design to really make sure financial services are relevant to- and wanted by- the mass market.